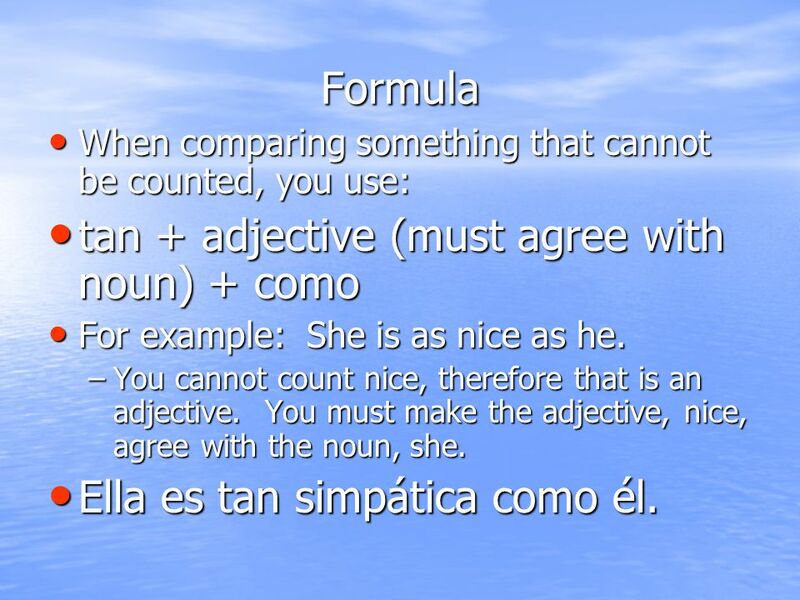 Formula When comparing something that cannot be counted, you use: tan + adjective (must agree with noun) + como For example: She is as nice as he. You cannot count nice, therefore that is an adjective. You must make the adjective, nice, agree with the noun, she. Ella es tan simpática como él. 4 More examples The girls are as athletic as the boys. 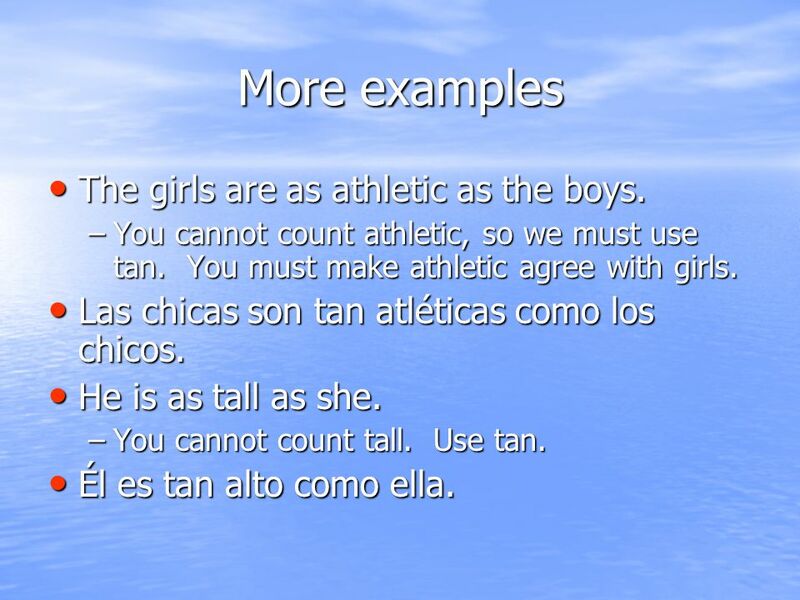 You cannot count athletic, so we must use tan. You must make athletic agree with girls. Las chicas son tan atléticas como los chicos. He is as tall as she. You cannot count tall. Use tan. Él es tan alto como ella. 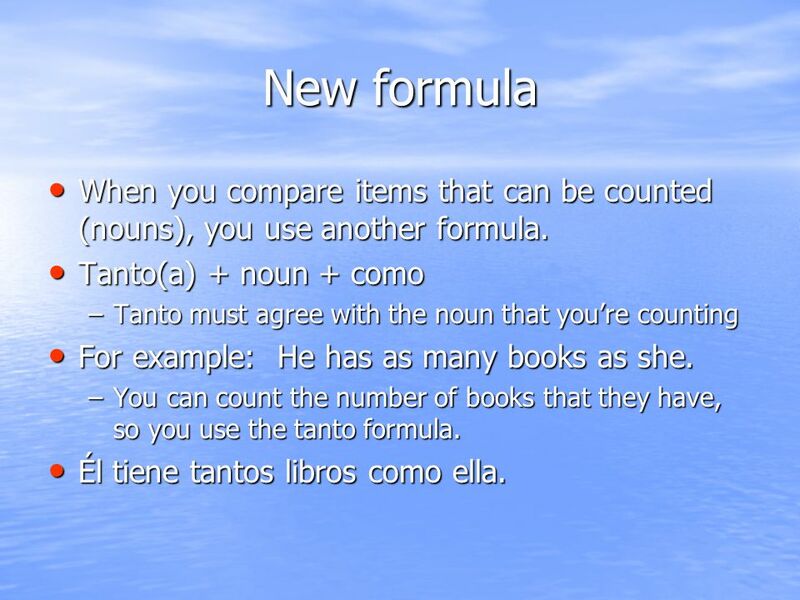 5 New formula When you compare items that can be counted (nouns), you use another formula. 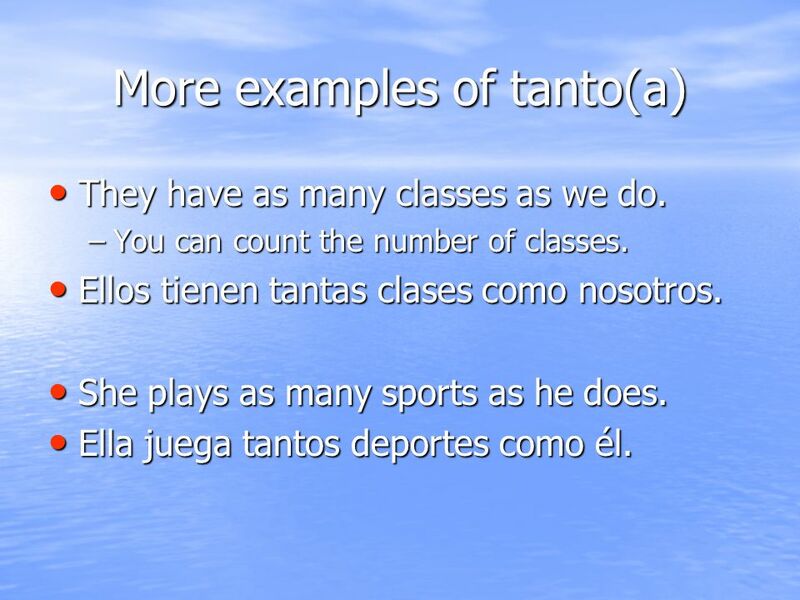 Tanto(a) + noun + como Tanto must agree with the noun that you’re counting For example: He has as many books as she. You can count the number of books that they have, so you use the tanto formula. Él tiene tantos libros como ella. They have as many classes as we do. You can count the number of classes. Ellos tienen tantas clases como nosotros. She plays as many sports as he does. Ella juega tantos deportes como él. 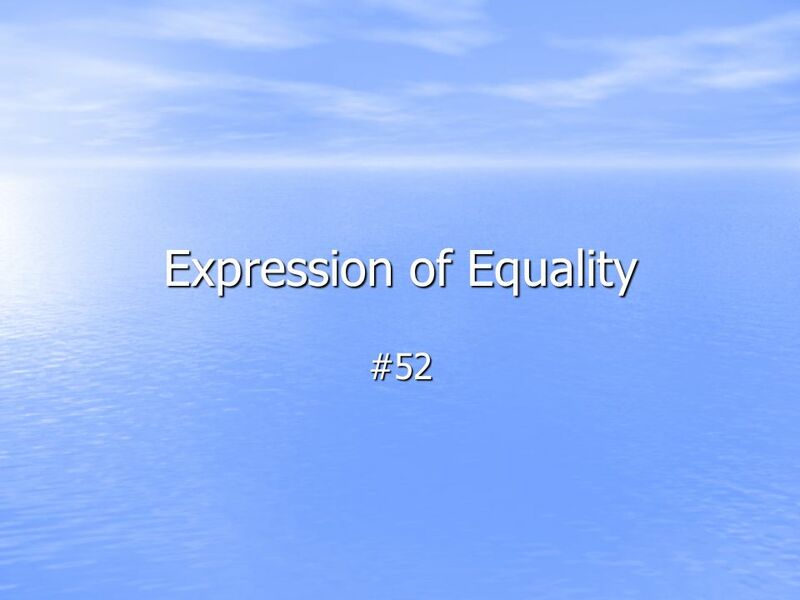 Download ppt "Expression of Equality"
Adjective use & placement SER (to _____) Yo ________ Tú ________ Ud. Él ________ Ella Nosotros ________ Vosotros ________ Uds. Ellos ________ Ellas be. SER = “to be” Spanish I. Los Superlativos. 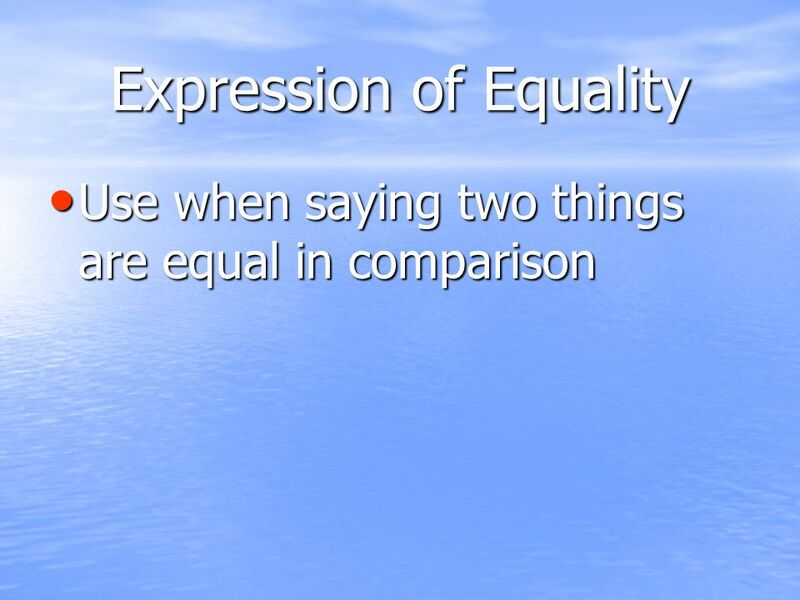 When you make comparisons, you say that one item has MORE or LESS of a certain quality than another item has. Más adjective que… More. Warm-Up: Escribe en español: 1.I am coming from the gym. I have just exercised. _________________________________________ __________________ 2. I play. Ana is taller than Miguel.= Ana is more tall than Miguel. Ana es más alta que Miguel. The doll is worse than the blocks.= La muñeca es peor que los. Comparación de igualdad. To compare QUANTITIES (how many) …as much ________as… Or …as many _________as… Rockefeller has as much money as Gates. We have.